Dave Rolfe with a cylinder head on the hoist Dave Rolfe is seen with one of the removed cylinder heads from the ex-50008 power unit on the hoist, the four valves are clearly seen in the base of the cylinder head. 30th March 2008. 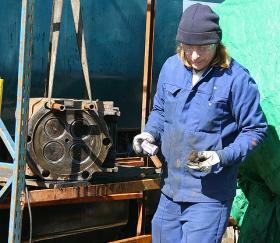 Dave Rolfe is seen with one of the removed cylinder heads from the ex-50008 power unit on the hoist, the four valves are clearly seen in the base of the cylinder head. 30th March 2008. Dave with cylinder head on hoist The electric hoist has proved essential in the handling of the cylinder heads which are too heavy to be easily moved around manually. The electric hoist has proved essential in the handling of the cylinder heads which are too heavy to be easily moved around manually. Ian and Pete grinding in valves Ian Kemp and Peter Carter are seen in the process of decoking one of the cylinder heads and its valves. 30th March 2008. 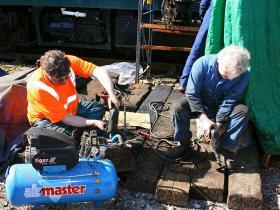 Ian Kemp and Peter Carter are seen in the process of decoking one of the cylinder heads and its valves. 30th March 2008. DSD box in 50030 The replacement DSD relay box has been overhauled and is seen fitted in the clean-air room, but is yet to be wired in. 30th March 2008. 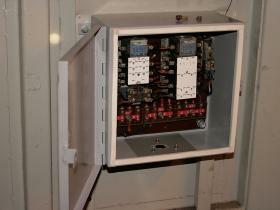 The replacement DSD relay box has been overhauled and is seen fitted in the clean-air room, but is yet to be wired in. 30th March 2008. Refurbished DSD box in 50030 A closer view of the content of the overhauled DSD relay box. 30th March 2008. A closer view of the content of the overhauled DSD relay box. 30th March 2008. 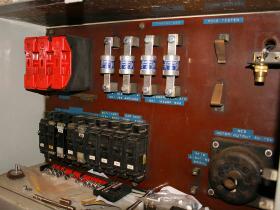 Fuse board with newly fitted fuses in 50030 The main Fuse / MCB panel in 50030. The red fuse carriers are for the two exhausters and the battery charge circuit. The blue Lawson fuses are for the blower motors and compressors, then there is the fuse test contacts and lamp. 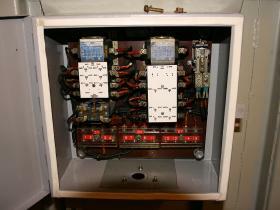 Underneath are control, cab heat and auxiliary MCB's, with the lighting timer fuse and motor cut-out switch. The main Fuse / MCB panel in 50030. The red fuse carriers are for the two exhausters and the battery charge circuit. The blue Lawson fuses are for the blower motors and compressors, then there is the fuse test contacts and lamp. Underneath are control, cab heat and auxiliary MCB's, with the lighting timer fuse and motor cut-out switch.